1 The last half of the nineteenth century and the first part of the twentieth were times of great change. Canada needed a leader who would stand up and make the difficult decisions. That man was Robert Borden. 2 Robert Laird Borden was born in Grand Pre, Nova Scotia, in 1854. Robert's father was a farmer, and his mother, a woman of strong character, was determined to see him do well. 3 Young Borden did so well in school that he was assistant school master by age 14. Five years later he was a teacher in Matawan, New Jersey. Two years of being a school master was enough to show him that he needed another job. 4 Robert did not have enough money to attend a university to study law. Instead, he articled with a Halifax law firm for four years. At that time he passed the bar exam. Later on in 1882, he became a partner in a Halifax law firm. 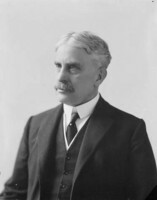 5 By the time he was thirty-five, Robert Borden became senior partner of the firm, and then he got married. It was not long before he became one of Halifax's richest and most prominent citizens. 6 In 1896, Borden took his first step into politics and became a Member of Parliament. Five years later he became the leader of the conservative party. 7 Borden disagreed with the downfall of the Liberal party. While Borden was not a great speaker like Laurier, he had a great capacity for work and getting things done. In 1911, his hard work paid off, and he became prime minister. 8 Before becoming prime minister, Borden had often criticized Sir Wilfrid Laurier for not being more loyal to Britain. When he sat in the same seat himself, Borden realized that Canada's relationship with Britain would have to change. 9 Borden visited Britain in 1915. There he met wounded soldiers and heard battle field stories. He was appalled at the level of incompetence of some of the British leadership.